Origin and Habitat: It is endemic only from a limited area east of the type subspecies between Amboasary and Fort Dauphin, Madagascar. Habitat: Grow in Alluaudia thorn forest. 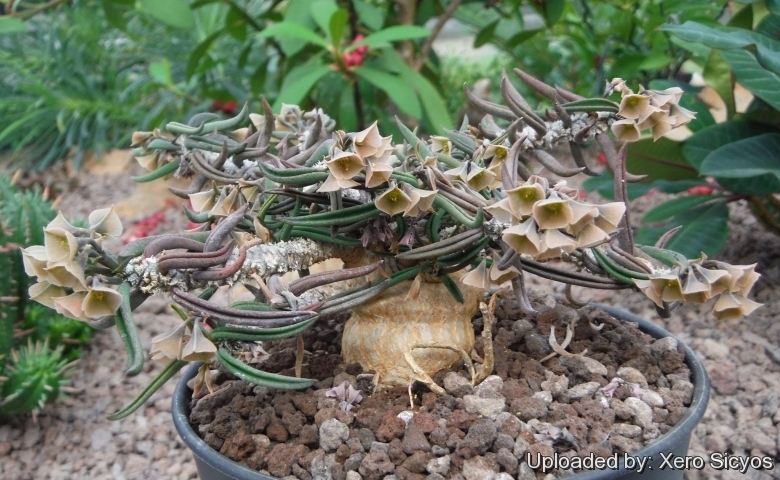 Description: Euphorbia cylindrifolia ssp. tuberifera looks a lot like the standard E. cylindrifolia subsp. cylindrifolia but never spreads by means of stolons, all the other characteristics are identical, namely size and form of branches and leaves, size and colour of flowers, size of caudex etc. 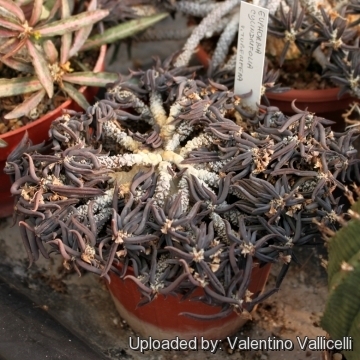 It is a dwarf, low-growing cushion-forming succulent with a rosette of narrow, serpent-like stems arising from a short, central subterranean caudex. Among the the Madagascan euphorbias species this is perhaps the most caudiciform. Subspecies tuberifera, when grown from seed, forms a conspicuous rounded tuber that can grow to fist-size or larger, but this is rarely observed in cultivation as that subspecies is easily propagated from cuttings, which only form fibrous roots. Both subspecies display the distinctive, narrow, cylindrical, slightly curved leaves channeled on the upper surface. Main stem (caudex): Tuberous, nearly spherical, top flattened, partly buried in the ground up to 10 cm in diameter, merging with the fleshy root. From the central growing point, the caudex produces numerous crowded branches, which look like a bunch of branches at the ground level. Branches: Erect, ascending-spreading or decumbent at the circumference, which look like a bunch of octopus tentacles and twist over each other to form a rather lumpy hemispheric cushion, up to 15 cm, about 5 mm thick, spineless, covered by leaf scars and tissue-like, membranous stipules in tight spirals up to 2 mm, eventually deciduous. While the branches of plants in cultivation are seldom deciduous, it can be argued that this species is geophytic - with the majority of the plant (the tuberous roots) occurring underground, and (under conditions of extreme drought) the stems being shed to conserve water. Leaves: In tufted rosettes at the tips of the branches, dark reddish-green, fleshy, up 2,5-3 cm long, terete, 3 mm in diameter, deeply channelled on upper side and bent into a hook at the tip. Inflorescences: Cyathia are produced singly or paired in subterminal cymes, peduncles up to 3 cm long, enveloped by large grey-violet to yellowish-pink cyathophylls, about 7 x 6 mm broad. Cymes 2 mm in diameter: Nectar glands elliptic, yellow. Fruits: Obtusely lobed 4 mm broad. Euphorbia cylindrifolia Marn.-Lap. & Rauh: (subsp. 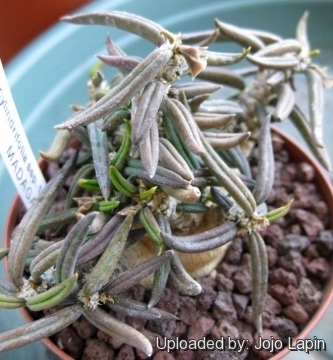 cylindrifolia) has rosette of narrow, serpent-like stems arising from a central caudex. Leaf blades cylindrical with longitudinal groove on the upper surface. It spreads by means of subterranean stolons rooting below ground. Euphorbia cylindrifolia subs. tuberifera Marn.-Lap. & Rauh: Except for the fact that it never spread by means of stolons, it is hardly distinguishable from subsp. 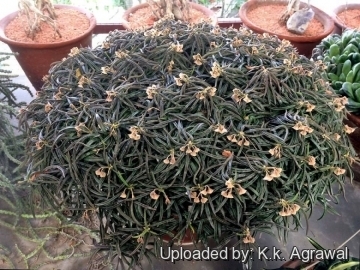 cylindrifolia, all the other characteristics are identical, namely size and form of branches and leaves, size of caudex etc. 3) Haevermans, T. 2004. "Euphorbia cylindrifolia ssp. cylindrifolia." In: IUCN 2012. IUCN Red List of Threatened Species. Version 2012.2. <www.iucnredlist.org>. Downloaded on 23 March 2013. Cultivation and Propagation: Euphorbia cylindrifoliais a particular favourite of caudiciform plant enthusiasts. Cultivation of this plant is the same as that for the other tuberous varieties of Euphorbia from tropical areas (Madagascar, and central Africa), but it is not the easiest of all caudiciform Euphorbias. It is particularly prone to rot if left cold and damp while dormant. .
Growth rate: It is a slow growing species and tubers take many years to enlarge. Caudex exposure: The remarkable tuberous rootstock (caudex) is usually raised above the soil line so that this can be seen and more readily appreciated. The plants raised from cuttings fails to produce a caudex and only develops fibrous roots, while seed raised plants produce a rounded tuber with age. For best results the tuber must be exposed only when plans become mature enough, usually after several years (8-12 or more years) of underground growth, as the exposed caudex will no longer increase in size once it has been lifted above the soil line. In very old plants, the tuber can achieve massive proportions, so keep a plant for many years to grow an unusually large caudex. Exposure: This plant has an excellent heat tolerance, and need full sun to light shade exposures, but can tolerate shade. However shade grown plants will tend to produce fewer, and etiolated growth (weak, gangly stems with unusually long internodes, and generally paler green colouration). The colour of this plant is much more marked if grown in full sun. But if it is possible to keep the growth of this species compact, with denser, shorter stems of a more uniform length (rather than looking weedy) such plants can be outright attractive. Watering: Water regularly during the active growing season. No water should ever be allowed to stand around the roots. Keep almost completely dry in winter. 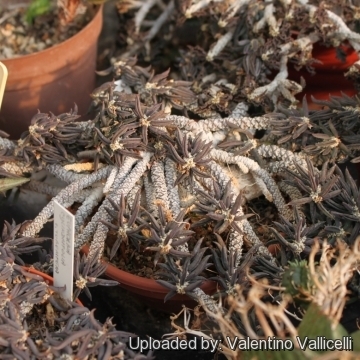 Even though the swollen caudex ensures a long lasting water reserve making it very tolerant of under watering, this Euphorbia is difficult, turning immediately to mush when over watered, or watered out of season. Care must be given in watering, keeping them warm and wet while growing, and cooler and dry when dormant. Hardiness: Tender. This spurge can be difficult to get it to look its best without a good amount of heat and sun and so it is only really suited to the tropics (USDA Zones 10-11). Keep the plant cooler at in winter, but maintain the light as bright as you can so that any growth which it may produce at this time will not be etiolated. It can be grown outdoors in the summer months to benefit from direct exposure to light, and especially exposure to high summer temperatures. Protection in a warm greenhouse, or even a garage for a month or two in the middle of the winter will greatly increase the survival rate. Rot: Rot it is only a minor problem with Euphorbias if the plants are watered and “aired” correctly. If they are not, fungicides won't help all that much. It is very unlikely to lose this plant from root rot from excessive water. Maintenance: Re-pot every two years and trim off the dead 'arms'. Propagation: The plant can be reproduced by seeds or cuttings. The seed will loose viability in storage, and may not be viable the following year, so the seed should be planted as soon after harvesting as possible. Germination usually occurs within about a week or two. If you remove an offset, remember to let it dry for some days, letting the wound heal (cuttings planted too soon easily rot before they can grow roots). Lay it on the soil and insert the stem end partially into the substrate. Try to keep the cutting somewhat upright so that the roots are able to grow downward. It is better to wash the cut to remove the latex. The newly planted stems take a few weeks to establish, and then start growing. Some plant form a perfectly symmetrical caudex when grown from seed, but usually fails to produce a caudex unless double cut when grown from cuttings. Once growth is strong, the top of the green shoot needs to be cut off again to force the plant to start a caudex. If a caudex is produced from cutting it is often distorted.